Home » Archive » Aberlour: Who's afraid of the big sherry monster? 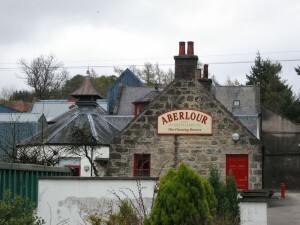 Aberlour is located on Aberlour Town, Speyside, Scotland at the crossing of rivers Lour and Spey near Ben Rinnes. Aberlour is gaelic for ‘the mouth of the babbling brook’ which probably refers to Saint Drostan’s well, the local spring depicted on the label of all Aberlour whisky. The distillery was founded in 1826 by James Gordon and Peter Weir. The original distillery was destroyed in a fire and rebuilt in 1879 by James Fleming. In 1892 the distillery was bought by Robert Thorne and sons who rebuilt the distillery and expanded it in 1898 after a second fire. In 1921 Aberlour was sold to WW Holt and Sons Ltd and purchased from them by S. Campbell in 1945, who expanded the distillery. In 1962 the floor maltings at the distillery were closed. And eleven years later the distillery was renovated again to add two more stills making 4 in total. In 1975 Campbell distillers was taken over by Pernod Ricard. Aberlour whiskies usually have a very high proportion of sherry cask whisky on its vattings, around 25-50%, making it a serious competitor for Macallan.